World Bridge Federation (WBF) | Uniting seven federations of the traditional mind sports : Chess, Bridge, Draughts, Go and Xiangqi with over 500 National Associations and close to one billion players. 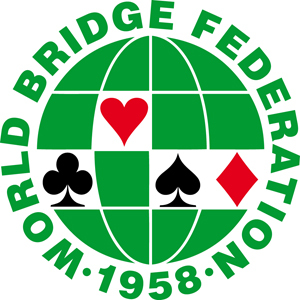 The World Bridge Federation (WBF) was formed in August 1958 by delegates from Europe, USA and South America. The WBF is recognized by the IOC as an International Sports Federation in 1999. In 2000 the WBF became a full member of the GAISF (now SportAccord). The World Bridge Federation has shown strong and steady growth and its membership now comprises 130 National Bridge Organizations (NBOs) on 5 continents with approximately 1,000,000 affiliated members who participate actively in competitive bridge events (locally, nationally and internationally). Based on many positive aspects of bridge the WBF promotes it as a sport for young and old. Bridge is a game of communication between a pair of players, playing in partnership, and their opposing pair. A contract is decided during the first phase, called the auction. Then the second phase involves the play of the cards and is based on information gained, together with the probabilities of card distribution. Duplicate bridge gives a comparison of results obtained by different pairs holding the same cards, and thus no luck is involved. It is, in reality, a game of skill and judgment, a true sport. Through its World Educational Foundation, the WBF has developed a teaching programme especially for schools supported by UNESCO. This programme is actively used in many countries (US, France, Italy, Germany, Netherlands, Poland, China, Indonesia…). Bridge provides excellent mental training and exercise, involving the calculation of probabilities, analysis of data and the use of memory. In Bridge, the understanding created between partners is of great importance and consequently communication, harmony and solidarity come first. Regular WBF Championships are held annually in the early autumn, in accordance with a four year cycle. (Bermuda Bowl, Venice Cup, Senior D’Orsi Cup and World Transnational Open Teams). The World Bridge Games Championships in the Summer Olympic year. The World Bridge Series in the other even year. The World Bridge Youth Championship every year.